Areopagus has been an integral part of Greek civilization. 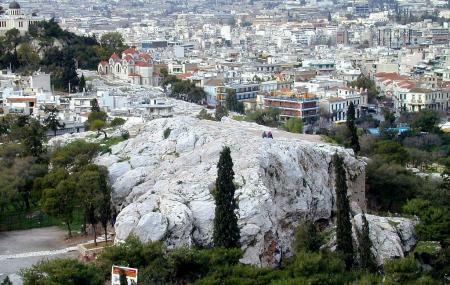 In ancient Athens, the Areopagus was used as a site for the council of elders to decide for homicide cases and other serious crimes. A mythological and historical site, the Areopagus hill, also known as Mars Hill, is a geological rock structure. A popular hiking trail, the climb to the top is easy and full of marble and metal steps. Also, the view from the top is breathtaking. The hill is an important legendary landmark due to its connections with Paul the Apostle’s speech “the unknown God”. As you climb towards this beautiful hill, you shall come across a bronze plaque with a Greek text of Paul’s sermon. Be careful since the ancient marble steps can be slippery! Visit at dawn or dusk to witness a magnificent sunrise or sunset. People normally club together Temple Of Apollo and Odeon Of Herodes Atticus while planning their visit to Areopagus. Better than acropolis! Great panoramic view of the city, and a nice angle of the acropolis from down low. Be careful the rocks are very slippery and it can get crowded during sunset. There is an amazing sunset and also sunrise from this spot, good place to chill out with friends. A perfect place for young people.